Nov. 3, 2018–Once the separation between commercial banking and speculation has been re-established, the problem of a supply of cheap, long-term credit for the physical economy is easily solvable. Given the enormous needs for infrastructure building and rebuilding, this will require Federal credit and Federal credit guarantees. There are various means by which this can be achieved, but americansystemnow.com recommends the legislation included below. What’s critical is that the parameters used for the issuance of such credit follow the principles laid out by Alexander Hamilton: They must add to the productivity (productive powers) of the nation as a whole. Thus, investments in infrastructure must be concentrated in the highest technological realm available—as in high-speed rail for transportation, nuclear power for power supplies, etc. In addition, funds must flow to frontier science-driver projects such as space exploration and nuclear fusion power, in order to provide the basis for the next generation of technological advance. 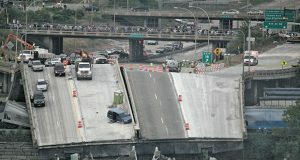 The Minneapolis bridge collapse of 2007–a wake-up call on the state of U.S. infrastructure. Historically, all the great leaps in productivity in the U.S. economy can be traced to the investments spurred by the great American System Presidents, from Washington to JFK, in what could be called Great Projects. These ranged from roads (National Road) and canals (Erie Canal), to railways (Lincoln’s Transcontinental Railroad), to water systems (FDR’s great dam projects and the TVA), to rural electrification and the space program (JFK). The Federal government’s specific role in these projects varied greatly, but in each case, provision was made for the debt incurred to be paid off over the long-term, through increased productivity in the economy, as well as for the Federal government to provide guarantees and dedicated funds for the payment of interest. a) There is a broad consensus in the United States that we have reached a point where urgent steps must be taken to repair and upgrade our crumbling infrastructure. The nation needs a modern, 21st Century infrastructure and industrial platform, as is being constructed in many parts of the world. The American Society of Civil Engineers, International Association of Machinists and Aerospace Workers, U.S. Chamber of Commerce, and North America’s Building Trades Unions estimate that a minimum of $3-5 trillion is needed to address the needs. A new national mission, like a Roosevelt New Deal or Kennedy Space Program, is needed to lift the nation out of economic collapse, falling real wages, and cultural despair. Only a concerted effort comprised of federal appropriations, state and local programs, and a new National Bank for Infrastructure and Industry (hereafter known as “The Bank”) can surmount this crisis. b) Especially since the repeal of the Glass-Steagall Act and the emergence of interconnected “universal banks” of enormous size relative to the economy, the Federal Reserve Bank has pursued a policy resulting in near-zero investment in infrastructure and negligible capital spending in industry. c) The establishment of The Bank operating as a commercial bank will be modeled on the approach of Treasury Secretary Alexander Hamilton to repurpose existing debt into useful projects. This was embodied in the First and Second Banks of the United States which generated remarkable increases in internal improvements, (infrastructure), and manufacturing. The Bank will utilize the most successful initiatives from those institutions, while balancing the needs and financial structures already in place. There is ample precedent for this. The application of Hamiltonian credit and bank policies has been extremely successful when used to advance production and increase productivity historically. The Lincoln National Banking Acts deployed this core approach to positive effect when constructing the rail, canal, road building, and industrial expansion which built the nation. President Franklin Roosevelt’s Reconstruction Finance Corporation, operating according to similar national bank principles, was instrumental in lifting the country out of the Great Depression and into a Golden Age of economic growth. The new Bank will restore the valid profit to the commercial banking system which arises from manufacturing, industry, increasing productivity of lands and soils, and the building of new, technologically advanced infrastructure which promotes these. d) It is a purpose of the United States Congress in creating The Bank, to return to the level of progress of the United States “golden age of productivity,” 1935-65, when multi-factor productivity advanced by 3-4% annually, in contrast to less than 0.5% annually over the past decade. (e) The Bank of the United States shall be chartered under the legislated means for carrying out the powers of Congress related to the purposes specified in Article I, Section VIII of the Constitution of the United States. (a) By this legislation, the Congress authorizes the creation of a public corporation to be called the National Bank of the United States for Infrastructure and Industry (The Bank) which is authorized to: provide credit for major national projects of infrastructure including surface transportation and ports, water management and supply, drought prevention, flood prevention and storm protection, electrical energy production and distribution, space exploration; make loans to agencies of the United States authorized for such projects; enter joint ventures with agencies of other nations to provide credit for major international projects of new infrastructure; provide credit to state and municipal capital projects by purchase of municipal bonds as issued; discount bank loans to businesses participating in such projects; and cooperate with the United States Export-Import Bank to provide trade credits to businesses engaged in international infrastructure projects. (b) Projects funded by the Bank of the United States would expand Buy America provisions, protect and encourage the use of Project Labor Agreements, require the use of Davis-Bacon prevailing wage standards, ensure racial and gender equity in hiring, and guarantee investment in disadvantaged communities most in need, in urban and rural jurisdictions. (2) outstanding municipal bonds of Federal states or cities of five (5) years or greater maturity, who shall subscribe these securities as stock in the Bank, and shall receive in exchange, preferred shares in the Bank, callable during a period of 20 years only by the Bank, bearing fixed annual dividend to be determined by the Bank’s Board of Directors, but not to be less than four (4)% per annum; dividend and redemption payments on the shares of the Bank to be guaranteed by the U.S. Treasury. (b) The Treasury shall be an “on-call” subscriber to the Bank in an amount up to $100 billion in new issues of thirty (30)-year U.S. Treasury bonds, and shall receive the same amount in preferred shares in exchange. (c) The Bank is hereby authorized to create deposits equal to the amount of each infrastructure loan made, subject to a total limit for all loans equal to the total capital subscribed to the Bank in the form of outstanding Treasury securities under Section III (a) (1) above. The Bank shall also accept deposits from individuals and corporations. It is authorized to receive repayment of loans into The Bank, and to re-circulate those funds into new or ongoing infrastructure projects. (d) The Bank shall be authorized to receive U.S. government revenue deposits, specifically of the proceeds of the Federal tax on gasoline (the National Transportation Trust Fund), as a fund with which to pay the interest on its preferred stock. The bank shall also receive U.S. Government appropriations dedicated to service the interest on the preferred stock. (e) The Bank shall receive into its circulating deposits, regular interest payments from the U.S. Treasury at intervals of one hundred and eighty (180) days on the outstanding Treasury securities which have been subscribed as capital in the Bank. (f) State and municipal agencies which receive capital project support through purchase by the Bank of municipal capital bonds, shall be required to keep on deposit at the Bank, five (5) % of the proceeds of such bond purchases, until the completion and final commissioning of the project involved. (g) The Bank shall be authorized to borrow from the discount windows of the Federal Reserve Banks for periods of up to one year, against state and municipal capital bonds which it has purchased. (h) The Bank shall be authorized further to raise borrowed capital for its project investments from the public, from commercial banks and business corporations, and from investment funds, by issuing additional debenture bonds up to a total equal to its subscribed capital; these liabilities of the Bank shall have a guarantee from the United States Treasury; the bonds of the Bank shall be qualified for purchase by commercial banks operating under Glass-Steagall standards, and shall be discountable at Federal Reserve Banks. (i) Subscribers to the capital of the Bank who are not U.S. citizens or U.S.-based institutions shall be non-voting shareholders. (a) The Bank of the United States shall discount loans to participants in approved projects, made by commercial banks operating under Glass-Steagall standards of regulation. The rate of discounting of loans shall be determined by the Bank’s Board of Directors, but shall not be less than 50%. (a) The majority of loans and discounts made by the Bank should coincide in maturities with the time periods of anticipated profitability and projected useful life of the projects and new facilities financed with such loans and discounts. (b) The Bank may make loans to companies involved in manufacturing related to the purposes of SECTION II for additional needs of capital expansion, where those companies can show that the additional capital cannot be obtained from local or regional private commercial banks. (c) The Bank may extend the time for payment of a loan, through renewal, substitution of new obligations, or otherwise, with the maximum time for such renewal to be established by the Bank’s Board of Directors. The Bank may make such further loans for completion of projects or additions, improvements, and extensions necessary for the proper functioning of the project, or which will increase assurance of the borrower to repay the entire loan or loans. (d) The Bank may make loans which are initially in cooperation with other lending institutions, participating in such loans by up to 50%. The Directors of the Bank shall establish an office of lending, discount, and deposit in each of the Federal Reserve Districts, and in any other state where Congress may require it by law. (a) There shall be 25 Directors of the Bank, appointed for terms of five (5) years by the President, subject to approval by the next annual general shareholders’ meeting. The majority of the Directors shall be actively engaged in industrial or engineering activity or have had at least 15 years’ experience in industry and/or infrastructure, to include at least two (2) representatives from the United States Army Corps of Engineers and at least two (2) representatives from the National Aeronautics and Space Administration and space industry, and three (3) officials of the AFL-CIO, including the Building and Construction Trades Department. The Board of Directors shall elect one of the Directors to be President of the Bank for a term of five (5) years and as necessary thereafter. The President shall be required to assemble a staff with experience in the commercial banking, engineering, heavy construction, and scientific fields, which he or she shall direct to assess the feasibility, productivity, and cost of investments. (b) The Directors of the Bank, at their first meeting, shall decide on the schedule of their periodic meetings, and on a rotating Executive Committee which shall have authority to approve infrastructure projects, including international agreements for projects of particular importance, between regular meetings of the Board. (c) The Bank shall receive from Congress an authorization of $100 million for the initial organization of the Bank’s Directors and staff. (a) The Bank shall not purchase public debt of the United States as issued, nor make any loan on the pledge thereof. (b) The total amount of the debts which the Bank shall owe at any time may not exceed the capital stock of the Bank plus its deposits, unless the contracting of a greater debt shall have been authorized by an Act of Congress.